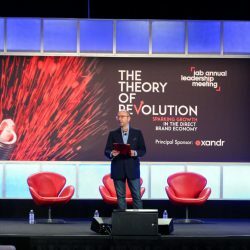 Traffic trading via Ad Networks would be considered a profitable business ten years ago, but now, in the era of programmatic, they apparently must die out. But the statistics and facts say otherwise. The quantity of ad networks is still growing: if we check the number of digital ad networks in Thalamus Advertising Database, we’ll see about 2,400 companies, which are registered there as “Ad Network”. At the same time, both publishers and advertisers are trying to shorten the chain of mediators. 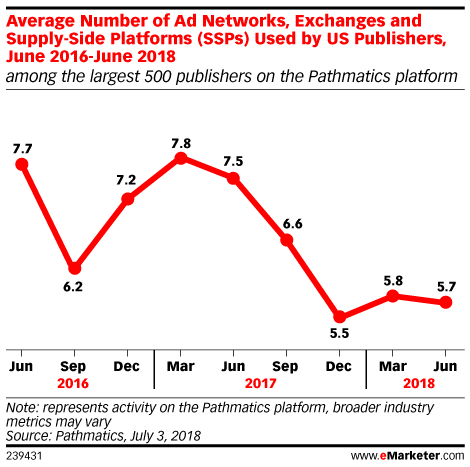 According to Pathmatics (ad tracking company), the number of sell-side vendors, which 500 researched publishers use per month (including supply-side platforms (SSPs), ad networks and ad exchanges), declined 26% over the past two years. In June 2016, publishers used 7.7 vendors per month to sell their programmatic inventory, compared with 5.7 vendors as of June 2018. The same story about advertisers: the number of DSPs, which advertisers use, decreased almost twice during the last two years. The main reason is losing revenue at every stage in favour to mediators. “The fees that some DSPs and SSPs charge are actually declining, but advertisers still face fees from data management platforms (DMPs) and other tech vendors. 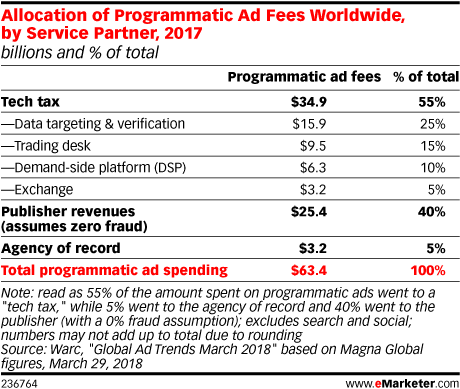 In March, Warc estimated that the total “tech tax” accounted for 55% of all programmatic spend worldwide”, writes eMarketer. Thus, and also due to the ads.txt initiative, more and more traffic resellers gradually lose their partner sellers and buyers, who want to shorten the chain of mediators. In such market conditions the smartest way of business development is not to be just a traffic reseller, but strive to sign direct agreements with end users: publishers and advertisers, and transact media buys between them. Which means to build and manage your own network. It is also possible to connect external DSPs and SSPs to such a network in addition to direct sellers and buyers, combining all possible sources to achieve higher revenue, but to concentrate on direct relations with end users. Some of publishers would ask, “Why do I need your network if I work via openRTB with several ad exchanges and that’s enough for me?” Well, if this publisher doesn’t have any direct advertisers and doesn’t want to have, that’s not the one you need for your network. The idea of Ad Network implies connecting publishers with direct advertisers. It allows to group sites by verticals, or by ad units quality (premium/remnant) and sell this grouped inventory to direct advertisers. The last receive a self-service platform to manage campaigns and buy traffic, choosing desired inventory groups. Some ad tech providers (like Admixer) offer programmatic demand to monetize publishers’ inventory and the integration here varies: tags/openRTB/header bidding. It should be explained to publishers to avoid confusion of the general business model and type of tech integration. So, if you decide to build own ad network, you should be able to explain advantages to publishers. For example, some small publishers will have an opportunity to be included to some thematic inventory group (e.g.,”News”), which will include more famous, bigger sites (e.g.,“Fox News”) thus receiving access to some premium advertisers with expensive ads. The best way to convince advertisers to work with your network is to offer them premium direct supply. 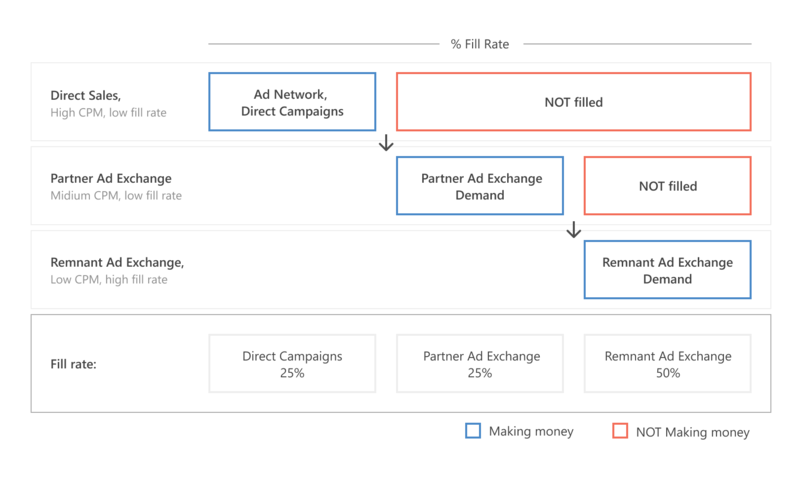 But for those who’ve just started their business, I have good news: some ad tech providers, who run their own networks and ad exchanges (like Admixer) offer their existing inventory, which helps significantly at a first stage. If you have some pool of potential clients, the question arises of using some existing SaaS solution or building it on your own. If you’re a part of brainy tech team of at least 30 – 40 people, who are ready to create and maintain the platform, you can try to do it in-house. In addition to programmers, you should cooperate with people who have deep industry knowledge and experience of working with both sides of the process. If you’d like to concentrate on network growth instead and not to think about the tech side and all the employees, it’s better to use some existing technology. Especially, the variety of them is extensive. Let’s get back to the Thalamus Advertising Database and along with “Ad Network” filter add “Ad Technology Provider” radio button. Now we’ve got the list of 345 companies. Anyway, it’s too much to research. If we google the most famous ad tech providers of ad networks, we’ll get an incredibly diverse list of companies with very different services, and each of them claims to be the best one, and sometimes you can’t trust what is said on the forums. Speaking about the forums: if we search for “How can I build my own advertising network with 3rd party services”, we’ll find this article on Quora, which might be quite helpful depending on your needs. 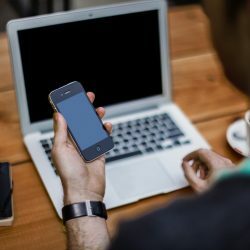 In any case, wherever you’ll be searching for your future tech partner, first you should formulate your needs to be able to filter these companies. Answering the following questions will help you with this task. What type of the network would you like to build? Traditional ad network implies that advertiser buys a “package” of impressions on a CPM basis. But there are also Performance or Affiliate Ad Networks: they usually use revenue share, CPC, or CPA pricing model. Such a network is rewarded a commission for delivering a specific result to an advertiser. The result is often a valid sale, however, it can also be a completed lead form, a new free trial user, a new app installation, or even a new newsletter subscriber. What kind of publishers/advertisers would you like to work with? For example, Premium Ad Networks offer the inventory from popular publishers exclusively and don’t work with small ones at all. Some networks group inventory based on sites’ topic — e.g., business ad network, technology ad network, automotive ad network, fashion ad network, etc. They are called Vertical Ad Networks. What kind of inventory would you like to focus on? There are networks, specialized in Mobile, Video, or Native only. It’s possible to focus on a certain type of inventory or to work with all the types simultaneously. Are you going to provide your clients with self-service platforms for ad management? Or are you going to create campaigns and manage inventory on your own? Maybe a classic ad server for publishers would fit your needs? These are the basic questions, building on which, you can start searching and comparing the competitors. Here are the main parameters you should compare. It’s better to combine direct sales with traffic monetization via programmatic sources: ad exchanges/networks/DSPs. Some ad tech providers offer their demand in addition to the technology: it helps to increase fill rates and monetize remnant traffic. Same story about inventory: some companies can offer their own inventory, if they have it. Thus, your network’s advertisers will be able to buy traffic not only from your publishers but also from external sources inside your network platform. Ad is not always an irritating blinking thing, ads can inspire and amaze! Choose a solution that allows to create catchy formats, which will bring the highest outcome for your advertisers. You can find examples of such ads at Google Rich Media Gallery, Admixer Creatives Gallery etc. 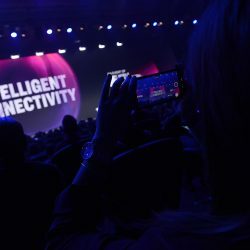 As Mobile now accounts for about 65% of total digital media consumption, mobile formats are going more and more popular today. The touch screen gives an opportunity to make banners with “scratch it” feature. Also, you can shake your phone as a part of interaction with ad and so on. As for video formats, they can be not only pre-, mid- and postrolls, but also video can be a part of some WOW-format. The possibilities are endless, go beyond simple banners! But don’t forget about IAB Standards and Initial Better Ads Standards. There are agencies/advertisers, who like to control everything: create campaigns by themselves, set targetings, add banners and track statistics in real time. It would be perfect, if you could create an account, which would allow to do everything on their own. Self-service for publishers, from the other side, is also an advantage. Most of them would already use some ad serving solution, but there are many publishers, who like to control their inventory: track statistics, manage bid floors, switch on/off particular ad units etc. So, try to find a convenient platform not only for Network Administrator and Managers but for your future clients too. To gather audience groups for retargeting or create Lookalike Audiences is also a good feature, which ensures the most accurate targeting of your ads. Those companies, which collect and scale or buy data, can offer such targeting options, like demography (gender, age) and behavioral factors (interests). For super-precise customers reach more and more advertiser use location targeting, i.e., ad targeting for a specific address. With its help you can refine your audience to people who live in, have recently been to or are traveling in that area. A report is the first thing your clients will ask for. It should include diverse metrics, load fast, and keep all the data as long as possible. The last one is very important for the analysis and decision making. It’s better if a network’s commission is hidden (already deducted) in publishers’ reports/accounts. Speaking about forecasting: some platforms include automatic predictions, based on numbers of previous ad campaigns. You set CPM, frequency, targeting and the period of the ad campaign and system predicts requests and impressions volume for this particular ad campaign, automatically deducting overlapping unique users. It helps advertisers with ad campaign planning and keeps their money. It is also important how long the platform can keep data: some of them can keep it for 2-4 weeks, some don’t have any limits and keep data as long as your account exists. Fighting ad fraud and eliminating low-quality inventory is a challenge for all the mediators, who work with multiple SSPs. The direct site-by-site integration with Ad Network allows to reduce such risks. What you’ll have to do is to create own “Sell-Side Policy” and validate each site before connecting to your network. From buy side, it is also important to verify ads: I’d suggest to develop a “Creative Acceptance Policy” and approve every creative of every ad campaign if you’re going to work with direct advertisers and agencies. Thus you’ll be able to guarantee your publishers they won’t see any inappropriate ads. You should also be aware of how the ad tech provider uses the data it receives through your network. Learn precisely the related clauses in the MSA before signing the agreement. Every ad platform provider claims its interface is intuitive, fast and user-friendly. But the easiest way to understand this, is to try them on your own. Send a request and go through the interface or look through the video tutorial if you find it. Many men, many minds, but it’s really important to find what you like as you’ll see this interface every working day. For some countries interface localization may be crucial: not everybody speaks English and pays in dollars, for example. It is very convenient when the platform speaks your language, when you can set any currency you want and adjust your time zone. Also pay attention how easy is to create a new account with some limited access, for example. Or track events: like which user made which changes. It may be not important at the very beginning, but at a top level, when there are more than 100 users of the platform, – and these are only your employees, – it’s crucial to track managers’ activity (as well as clients’). Find out if billing is built into the system and how exactly. It is convenient to create, send, approve or reject all the invoices inside the platform. If it allows to pay right from the interface using some common payment systems, it would solve many issues and save time for your accounts department. When it comes to knowledge and support, it’s important to work with the owner of the platform, not the mediator. Don’t be afraid to ask if the platform was written from scratch in house and if the company owns the code. Implementing and explaining such a complex technology is not something you want to be done by an intermediary. You can also research company profile on LinkedIn to verify the number of employed developers. The real technology builder must have enough engineers to maintain the system functionality. Ask how many servers the company has and where they are located. If your publishers and advertisers are located in the USA, for example, and the only data center is in Amsterdam, this ad tech provider won’t fit as there will be a big latency in requests which will cause impressions (and, as a result, revenue) losses. In case you would like to promote your own brand, you’ll need a white label option. So, search for those platforms, which can white-label the technology. For example, Admixer.Network offers to white-label not only the interface but also customize your tags and URLs. If a company has lots of products and developed infrastructure, launching some new solutions from time to time, it is a good sign. The company site and blog can tell you about history of its development and its main events. You can search for company profile on LinkedIn as well and look through the number of employees. Gather as much info as possible before signing the contract. When choosing between well-known leaders of a market and unknown young startups remember about pros and cons of both options. Mature companies would be able to provide a stable service, they may have a big amount of supply and demand partners, which can be connected to your network. But if you need an urgent support or develop some custom feature, you may not receive it. At the same time, newcomers will try to keep every client and try to provide the most dedicated support 24/7. They will probably be able to offer tailored development and platform customization according to your needs. But be ready to unpredictable blunders from unexperienced beginners. My advice is to choose the middle ground. Make sure you’ll get a required level of technical assistance and clarify what kind of training options they provide for the platform. It’s better when ad tech provider is not only an ad tech provider but also the owner of the network itself. Thus, working every day with publishers and advertisers directly, the company knows the exact needs of its clients. Such an experience helps to improve the product, make it more convenient and meet users needs. Ask for some successful cases, for their clients’ names, some references. You can find such a case description in a company blog, like “Case Study: how to build and grow your Ad network” in Admixer’s blog. Also just google the company name and try to find some comments. After all, the more info you have, the better. Even if some of data sources may seem unreliable, you’ll get the whole picture and draw your own conclusion. It seems a lot of work should be made to evaluate the platform for network building. That’s true for launching any new business: all the pros and cons should be carefully weighed. I hope this guide would help you ask the correct questions and choose the best option according to your needs. 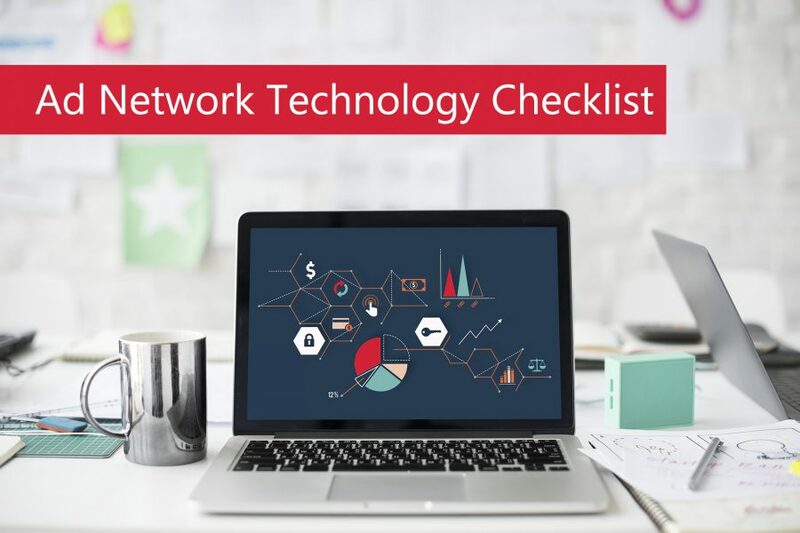 If you already have a network and successfully manage it, but your tech platform is outdated, look through the existing solutions, perhaps it’s better to switch to some modern and stable platform instead of your current one? With such perpetual changes in the industry, tech is changing as well: so, move with the times, monitor new tendencies and always search for the best solution for your business.